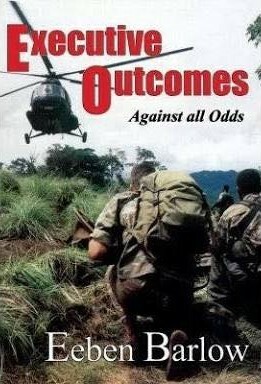 My book, ‘Executive Outcomes: Against all Odds’ will undergo a revision, a re-edit and then be republished sometime later this year. The book will also be updated with new material. The book was initially published by Galago. However, since Peter Stiff’s untimely passing, the rights to the book reverted back to me. Peter was the only publisher (both locally and abroad) that was prepared to publish the book as too many considered it ‘inopportune’ or ‘not politically correct’. I will forever remain grateful to him for his publishing courage. Some wanted me to remove the names of their journalist friends I named as disinformation agents and outright liars—or of the duplicity of the then South African government. Other publishing houses informed me that the book ‘was not in the public interest’. Some simply ignored my initial manuscript. Several book stores steadfastly refused to carry it on their shelves once it was published. At that time, it was apparent to me that the book simply did not match the narrative that had been so successfully, albeit nefariously driven by several local and foreign intelligence services and media houses. For that reason, it had to be stopped. Efforts to stop publication of the book bordered on the ridiculous. Threats of violence against me should I continue writing the book, as well as the burglary at my home where only my computer was stolen, were, I suspected at that time, part of the efforts to stop the publication of the book. Having gone through numerous reprints, there have, to date, been no revisions to the book. Finally, I have an opportunity to revise the book, have it re-edited and also include new information as well as some information that was initially cut out in the final print editions. The new edition will be a collaboration between my current publisher and Bush War Books (www.warbooks.co.za). There will also be a limited and numbered hardcover edition (most probably only 50 copies) which will each include an Executive Outcomes commemorative coin. The hardcover books with commemorative coins will only be available through Bush War Books. For anyone interested in the numbered hardcover copies, please contact Bush War Books directly as they will be the exclusive outlet for those copies once the revised edition is published. My thanks to everyone who encouraged me to revisit the book and requested that it be updated and re-released again. Is there a means of communication i can use to message you directly and privately? I am a serving military officer currently working my way through staff college. I am keen to pick your brains on an issue if possible. You can contact me on this means Douglas until I know exactly what you require. As you can appreciate, I don't give my email address to people I do not know. I just have to purchase a copy. This book is now impossibly expensive, sir. What steps can you take to reissue it? I have been away with work for the last few months and playing catch up on your blog. I just ordered a copy of Composite Warfare from Bushwar books and preordered this new up and coming EO rework. We know some of the same people i am to understand. I work in land and maritime ops in Nigeria, Benin, Togo and Sierra Leone, born in Salisbury in 74 and returned to the UK in 81 with family, attended RMAS in 97 and went to private military contracting in 2010. Glad to see you are still blogging and doing what you do best. I wish you and STTEP a continued bright future and maybe someday we might bump into each other in SA or who knows where for a cold beer. Good to see you are keeping EO in the bookshops - the definitive reference book for counter-insurgency. Bravo Zulu Echo Bravo. I already gave you a good review on Amazon, but your book is so good I will pass up the chance to sell it for £137 (I paid R260 when I got it a few years ago in Joburg airport). Thank you for an excellent blog. When will your revised edition be out? Is it possible to pre order the limited edition? Is it possible to get it signed? "Echo Bravo"... Jy ken my nie, maar ek't so pas jou boek EO Against all odds gelees... Great Stuff man. Hulle sê: "One swallow can't make a summer". Verkeerd bewys! Ek is nie 'n "groupie" nie, maar wil graag kontak maak met jou broer Ivan. Ons het saam by AEK gewerk, wil hoor hoe dit met hom gaan asb. I will definitely do my best to order a hard copy. I have the original which inspired a change of career which has resulted in a more fulfilled and happy life. Thank you. I found my calling and the path to courage through your story. Thanks for your interest Lexington Green. It will soon be republished...and hopefully it iwll be more affordable. Thanks Shane, those are kind words and I hope you have a great career! Thanks Johan - I will definitely let Ivan know that you are looking for him. Thanks for your interest Magnus. You can pre-order from www.warbooks.co.za. I know they have been taking pre-orders. Thanks for your interest Johan. Many thanks Tony. It has been a hard slog to get it done but finally that chapter came to an end...I think a good end though! Thank you for your good wishes, Major, as well as your wishes to STTEP. It is much appreciated. BTW, did you get the book you ordered from Bush War Books? I wish you good luck too with your contract work. You will find ways of ordering it from my latest post Magnus. Thanks for your interest! Thanks Johan. I will pass on your email address to Ivan.